Have you heard of swatting? Apparently this is becoming increasingly common in online circles and video game communities where someone calls in a fake emergency to invoke a law enforcement (and possibly SWAT team) response on another person. Which, just, it feels like there are so many levels to this, not the least of which that it takes literally nothing more than an anonymous call for a truck full of armed paramilitary operatives to shoot up someone’s home. As far as social media sites go, I feel like Reddit is doing the best job at moderating out the most toxic elements of its user base. It certainly hasn’t been perfect, but I appreciate that they’re so frank about the fact that at some point you need to apply somewhat arbitrary standards to your platform to keep it from devolving into chaos. Also the nature of subreddits, which largely act as self-policing communities with their own individual cultural mores, allow the worst echo chambers to be silo’d away from the rest of the site. I’m also majorly obsessed with Janelle Monae’s new singles Django Jane and especially Make Me Feel. (possible nsfw: language, sexual content) I’ve been a huge fan of her music since ArchAndroid and truly believe she’s one of the best performers out there. We were able to see her during her Electric Lady tour and, my goodness, her stage presence is off the charts! 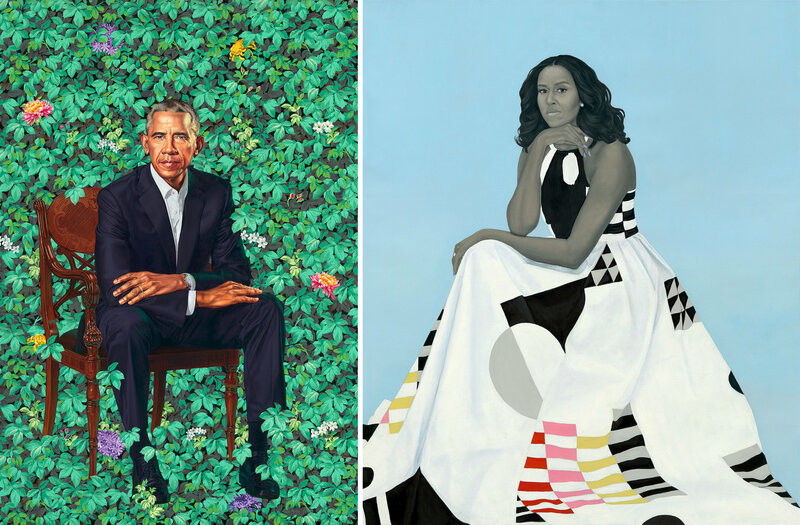 Also, I know I’m late to the game on this but the Obamas’ outgoing presidential and first lady portraits are a-m-a-z-i-n-g. Amy Sherald painted Michelle Obama’s portrait while Barack Obama’s was painted by Kehinde Wiley. My fiancé and I gushed about the choice of painting the president among a backdrop of greenery, it feels reflective of the way President Obama strove to run the government. Contemplative but powerful as well as wonderful complement to Wiley’s other portriats painted among floral backdrops. Previous Post Are Career Coaches Worth It? I’m going to need to bookmark that article about Reddit! I find various kinds of internet communities (and their respective cultures) extremely interesting, even though for the most part I’m thinking about really small communities that aren’t, objectively, important or interesting, really. I was around for some of the big things that happened on Reddit, including when they blocked a handful of the most toxic groups, though there’s always more work to be done. I do get lulled into a false sense of security with Reddit because I tend to only follow a small list of subreddits that are generally very women-friendly, and even in the more general interest groups, I think the communities do a decent job downvoting the problem stuff. Every so often, though, I see something problematic, and it’s frustrating. The main r/news group is probably the most awful group I click to sometimes, lots of people in a hurry to upvote that fake news about CNN scripting questions for one of the Parkland kids based off one of the dad’s doctored emails, or Bari Weiss’s piece about the Aziz Ansari thing (so many people eager to say #metoo’s gone too far ugh). So much of reddit was a cesspool that I forget that there are decent subreddits until neat people share them. Though I guess those folks migrated to 4chan, didn’t they? I heard white people explaining swatting to each other at a museum and it was weird, not one of 8 adults seemed to think it was a serious issue at all or were even aware that it’s been going on for a while. There are still definitely subreddits I won’t touch with a 10-foot pole, but I feel like you have to actively seek out the really bad stuff. Also yeah a lot tends to migrate off-site.